After our move to Los Angeles many people we encountered asked “have you been to The Getty?” Our answer was “not yet, but we are planning on it before we leave next year.” Living in a place with so many touristic attractions is a double-edged sword: you’re never in a hurry to visit must-see places, because there’s always a another weekend approaching. 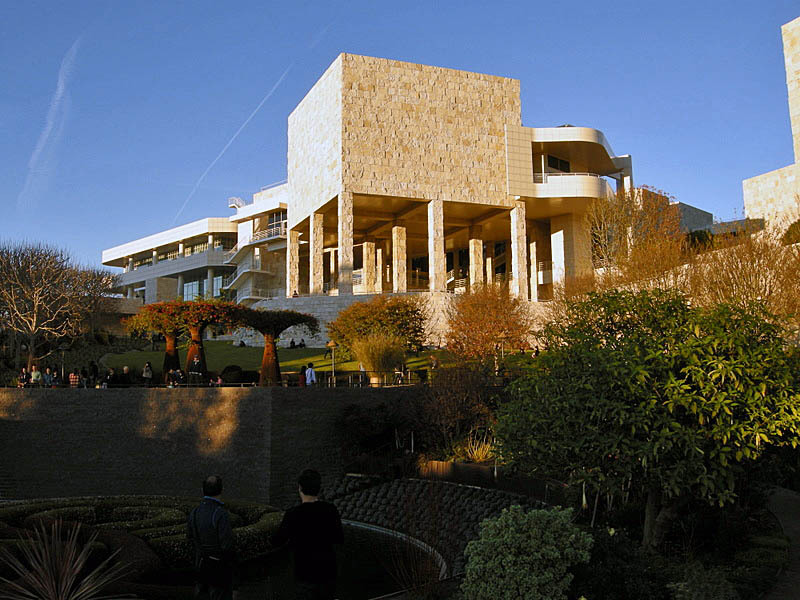 Then, suddenly you realize that half of your stay is over, and the clock starts ticking… We didn’t want to miss it, so last week we took an afternoon off to visit the Getty Museum, located just 10 minutes from our home. Majestic, marvelous architecture, with breathtaking views of Los Angeles below. The Impressionist collection includes a masterpiece by my favorite painter, Vincent Van Gogh… and the museum’s garden is itself a work of art! We took two guided tours, the first of which highlighted the major artworks (paintings, sculptures, furniture, tapestry), and the second of which explained the design of the Central Garden . The latter masterpiece was conceived and executed by Robert Irwin. It adds a dreamy element to The Getty, from the delicate stream of water flowing down to the constant change in shape and colors of the plants. Irwin once called it “a sculpture in the form of a garden aspiring to be art.” To remind visitors of the ever-changing nature of his compostion, he engraved these words at the bottom of the central stairway: “Always changing, never twice the same.” It was unforgettable. I highly recommend the guided tours. Just like admission to the museum, the tours are free, and they add to the whole experience. I am a great horse-lover, I have lived in Vienna for a year (back in the seventies), I even had to stop to let the white stallions cross the road to their training hall on my way to work, and yet in the end I never went to see their show. It’s something I regret to this day. It’s easy to make this type of mistake – I have to confess that there are countless things I’ve never done in my hometown (Sao Paulo, Brazil), simply because I was born and raised there. The other day we were reading one of those magazines in a plane, and they had an article on things to do if you had 5 days in Sao Paulo. I was shocked, so much cool stuff I’ve never even knew existed! I discovered your blog through the WordPress forums. I was going to send you a note, but couldn’t find a “contact” link. Thank you for posting the help link to the problem of the missing “save draft” option (back in September). The same thing occurred on my blog today, and because of you, I was able to find it and return it to its proper location! Thanks! Well, Dianna…. thanks to your comment I now realized my link with “contact me” is gone! Probably has been gone for a while, and I never noticed. Will try to restore it as soon as possible. Thanks for letting me know! You helped me – maybe I returned the favor! Now can you tell me how to upload a Gravatar photo that doesn’t look like someone “smashed” me!!?? The gardens do look as stunning as the art. I’d love to visit the museum next time I’m in LA.